Organisational Diagnosis has endorsed TRIPOD methodology to efficiently investigating systemic accidents. Those occurring around the operation of high reliability industries like Aviation, Maritime, Oil & Gas, Defence, Financial Sector, Rail& Transport, Energy, Health care, etc. TRIPOD Beta trees are the outcome of a guided thinking to test what really happened in terms of examining how trios interact during an accident. (Objects-Change Agents-Events).The method, presents in rational succession the accident sequence and in a Barrier Based approach, it depicts the effectiveness of barriers in place. The investigation outcomes themselves promote the generation of ideas for new barriers; those barriers identified during the accident analysis as missing, and consumes efforts to identify preconditions (thoughts that were preventing action on the right direction) making barriers fail. 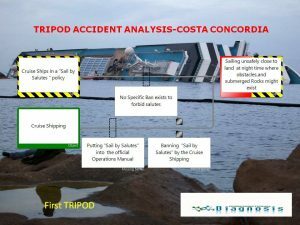 More information about TRIPOD incident/accident methodology you can collect (here). Therefore, we propose a 4 Days’ Workshop (32 hours) course to master the methodology up to a practitioner level. The Course includes a number of case studies with the analysis of known accidents related to Industry it addresses. Training can be further customised not only in line with the Industry it needs address, but also to include specific accidents-case studies, upon request.